I picked up this book (for $1) at the library sale yesterday. I had a quick read through it last night. What a fun book it is. All kinds of little hints and tidbits of information. 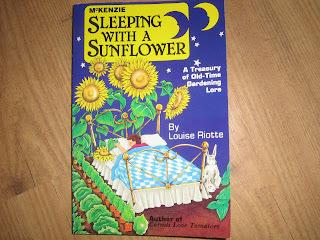 You gotta love a gardening book written by a woman who eats weeds. :-) It is organized by month, to give you information when you need it. This is how it starts out, "Wouldn't it be fun to go back in time to a earlier, simpler day....."
Raises the question of "what is a weed?" You always seem to find the most amazing books, Heather!